London, United Kingdom — TEA REX, a forward-thinking fresh fruit and root infusion tea brand, is targeting the corporate market with a healthy alternative to coffee. The startup, which is on a mission to disrupt the beige bag status quo of the tea sector and stir up the industry, is currently trialling partnerships with Linkedin and the Daily Mail and will be stocked in Sky’s offices by the end of the year. “It’s inspiring to be working with businesses who put staff wellness at the centre of their working environment,” commented TEA REX Founder Andrew Walker. “We’ve been actively approached as a way to reduce caffeine intake and increase healthy hydration. Offering TEA REX to staff also acts as a way to demonstrate that the business is at the cutting edge of food and drinks innovation,” he added. 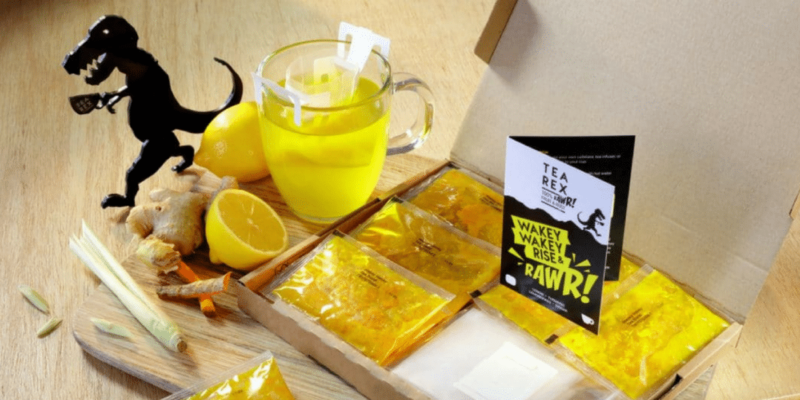 Using HPP, TEA REX’s unique formulation is made from fresh, raw ingredients and can be posted directly to the public, however in order to kick off its mail order service the brand needs to produce a minimum run of 14,000 sachets per production run. To facilitate this, Walker recently completed a Kickstarter campaign, which surpassed its target, raising 20% of funds within the first 6 hours. The entrepreneur is particularly keen to reach investors with an interest in health and wellness, who will be reward with product discounts on packs to serve friends and colleagues. “In a rapidly growing fruit and herbal tea market, with an increased consumer demand for wellness-focused natural products there is a game-changing opportunity to create a new category in fresh infusions,” explained Walker. “Challenging the traditional retail channels by asking the consumer to buy directly and help get TEA REX going means they are part of our adventure. This is what I’m most excited about,” he added. Currently, the brand is producing two blends, the ‘WAKEY WAKEY’, a mix of lemon, turmeric, ginger, and lemongrass, and the ‘BERRY TIME’, a fusion of blackberry, blueberry, raspberry, lemon and ginger. Both infusions can be brewed in a teapot, infuser or a disposable over-the-cup filter which TEA REX provides with every sachet. In addition, all of the teas are brewed specifically using innovative and convenient over-the-cup filters -– this ensures the ingredients sustain the highest level of flavour whilst delivering the maximum level of nutrition too. Following the crowdfunding campaign, Walker hopes to build a direct to consumer subscription service in parallel to its retail and foodservice offering.